Members: Please use the wiki pages to indicate your participation in these activities. Many BayLUG members are also members of the Bay Area L-Gauge Train Club, or BayLTC. We display our LEGO model trains and scenery at model train shows and other public exhibits. You can become a member online through our web site. We invite everyone to join our new public announcement list. You will receive event and meeting reminders. There should only be 1-2 messages a month. BayLUG members Steve and David Parmley gave a LEGO® presentation to a group of fourth through eighth graders at the International School of Monterey in Seaside, CA. They shared MOCs with the kids, discussed inspiration for MOC subject matter, sourcing LEGO parts, LEGO clubs like BayLUG, LEGO conventions, and of course answered many questions. The International School of Monterey hosts a "School-wide Enrichment Model", or SEM, where parents and members of the community join the ISM staff to offer interactive workshops to groups of 8-20 students for 85 minutes on a series of six Friday afternoons each trimester. On Saturday, September 22, a handful of BayLUG members met with Kevin Hall and Emily Corl for lunch in San Francisco. Following lunch, we made a trip to the LEGO Store. BayLUG members once again put together an exciting display for the public to enjoy. In addition to the perennial favorites like the town layout and interactive play area, the crowd seemed to especially enjoy the Great Ball Contraption counter created by Jack Slovacek and the array of Technic motors by Clark Wood. The collaborative displays of the amusement park, GBC, and Micropolis each looked great and featured some excellent new models. If you’re interested in helping grow these displays be sure to check the club’s wiki for more information about how to get started. The overall display attracted a lot of visitors and was admired by many. The audience asked tons of great questions about the models and members engaged in fun conversations spreading the word about BayLUG, BBTB, and the LEGO® hobby in general. Thank you to everyone who attended and helped make this happen, hope to see you next year! For the second year in a row, BayLUG brought the only LEGO® train layout to The Great Train Show at the Santa Clara County Fairgrounds. Spectators were genuinely surprised to see a LEGO layout amongst all the traditional model railroad displays. Nick Jackson made his first foray as Layout Foreman and designed an impressive display. Great Job Nick! BayLUG's next public show will be at Maker Faire Bay Area in San Mateo, May 18-20, 2018, where we will be displaying an even larger LEGO amusement park! We also plan to bring numerous other creations to show and will have a children's play area so they can build their own creations. Join us! The Annual Holiday Show Returns! December 8, 2017 marks the return of BayLUG's annual holiday show at the Museum of American Heritage in Palo Alto, CA. BayLUG has built and exhibited a LEGO train layout in this same location for many years. This year is our 14th holiday show, and visitors will be treated to a variety of moving LEGO trains, a cityscape, suburbs, and rural lands. Our members also have individual models on display which include mosaics, vehicles, abstract structures, jewelry, Christmas ornaments, sculptures and even some vintage LEGO kits. Most everything on display will be original creations built from the minds of our members, rather than from instructions. The show runs from 11:00am to 3:45pm Friday, Saturday, and Sunday for six weekends, with the final day on January 14, 2018. Admission is $3 per person (babes-in-arms, MoAH/BayLUG members and their guests are free). The Museum of American Heritage is located at 350 Homer Avenue, Palo Alto. We will be closed on Christmas Eve (12/24). This is a fun event for all! Several BayLUG members attended the eighth annual Bricks by the Bay convention (August 3-6, 2017 in Santa Clara, CA) and participated in a train/city/rural layout. There were some new MOCs ("My Own Creation"s) on display, as well as some of our tried-and-true favorites. A few of our members took home individual trophies for their builds, and BayLUG received a trophy for "Best Small Team Build" in the "Large Display" category. BayLUG was also a sponsor for Bricks by the Bay, as we have been since the convention's inception in 2010. One unique feature about our layout is that it was combined with the "High Seas" category this year. Thank you to all of our members who participated. We even had a building on display by two members who were not able to attend the convention! 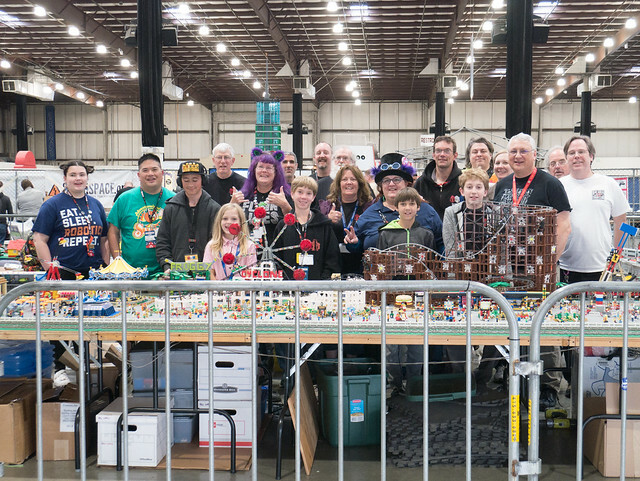 BayLUG had an impressive showing at this year's Maker Faire Bay Area. The club members set up one of the club's larger displays that featured running trains, an amusement park, a downtown with skyscrapers and a nice variety of other creations. Additionally, some large warships sailed into the display, and Rube Goldberg-like Great Ball Contraptions showed off some of the the wacky mechanical features that can be created with LEGO ®. Makers of all ages dabbled with their own creations using club-provided LEGO bricks in our hands-on area. BayLUG is always proud to display at this event. If you missed it this year, make sure to plan for the 2018 show which will be in late May next year. After several years' absence from San Jose, The Great Train Show returned for the weekend of February 25 and 26, to the Santa Clara County Fairgrounds. BayLUG's special interest group, The Bay Area L-Gauge Train Club, made a showing and was the only LEGO train layout in a sea of HO, N, Z and other model railroading scales. We set up a 20' x 20' display and received lots of compliments from the attendees and other exhibitors. Bruce's Cabforward was a hit with all, but especially with the other model railroaders. It was great to see some newer members participating from beginning to end, and as is typical with our shows, we likely recruited at least a few more members! A great big thank you to all who helped set up, brought models, and helped to load out! December 9, 2016 marks the return of BayLUG's annual holiday show at the Museum of American Heritage in Palo Alto, CA. BayLUG has built and exhibited a LEGO train layout in this same location for many years. This year is our 13th holiday show, and visitors will be treated to a variety of moving LEGO trains, a cityscape, suburbs, and rural lands. Our members also have individual models on display which include mosaics, vehicles, abstract structures, jewelry, Christmas ornaments, sculptures and even some vintage LEGO kits. Most everything on display will be original creations built from the minds of our members, rather than from instructions. The show runs from 11:00am to 3:30pm Friday, Saturday, and Sunday for six weekends, with the final day on January 15, 2017. Admission is $3 per person regardless of age. The Museum of American Heritage is located at 350 Homer Avenue, Palo Alto. We will be closed on Christmas Eve, Christmas Day, and New Year's Day. This is a fun event for all! BayLUG Represents at new SF LEGO Store! The brand new LEGO Store in the Westfield San Francisco Centre held its grand opening celebration the weekend of August 26-28. Several, and I mean several, BayLUG members showed up all three days to be some of the first in line to get the promotional goodies. BayLUG members Erez, Robert, and new member Matt were all featured in the local news. Plus our very own Megan posted a wonderful news article on Brickset. On June 11, 2016, BayLUG President Russell Clark traveled to Southern California to compete in the LEGO Star Wars: The Freemaker Adventures Battle of the Bricks. The competition was broadcast on the Disney XD Youtube channel with the last ten minutes being live. There were four teams consisting of LEGO fans and Youtube personalities. After completing four challenges, Russell's team came out in first place! Here you can see an image of the trophy. On Saturday, July 2, 2016, BayLUG made its first appearance in Monterey County at the Pacific Grove Summer LEGO Show and Building Event. The show, co-sponsored by BayLUG and The Regional Artisans Association, was a great success and featured a variety of our members' original creations. On display were numerous mosaics, historical structures, city scenes, an aircraft carrier, several Duplo figures, a zoo, a futuristic cityscape, a Disney tribute, and many more examples of our members' creativity. Well over 1,000 Monterey County residents and visitors were treated to our MOCs, asked questions, and were inspired by what can be created with LEGO. The local kids got into the act too, building their own MOCs with our club's play brick. They were able to proudly display their creations in their own area, and some of their creations would fit right in with ours! We have already been invited to return for another show ... stay tuned! Photos from the show were featured in the local newspaper. For older news see 2014 News and 2013 News.